Getting all the 'Praise Baby Collection' CDs in one gift set gives you 4 full CDs of (non-seasonal) titles gift-boxed for you to keep or give - and at a special top value price. If you are looking for an extra special gift for a newborn you will be delighted with this gift box package. The collection makes it easy for you to collect the entire set of Praise Baby titles and build family favourite praise and worship songs for a long time to come. Praise Baby Collection Gift Set 4CD by Praise Baby was published by Authentic in October 2007 and is our 13263rd best seller. The ISBN for Praise Baby Collection Gift Set 4CD is 0083061086220. Be the first to review Praise Baby Collection Gift Set 4CD! Got a question? No problem! 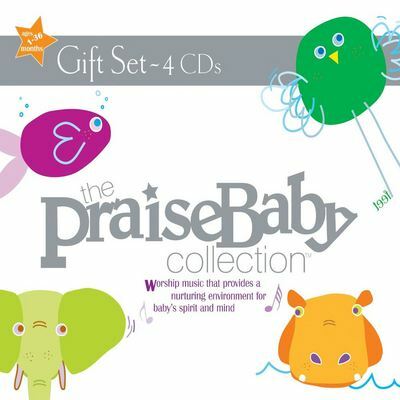 Just click here to ask us about Praise Baby Collection Gift Set 4CD. Now Playing: I Could Sing Of Your Love Forever Your browser does not support the audio element.